MacX Video Converter Pro is world's 1st video converter for Mac that adopts both CPU and GPU hardware acceleration techs (Intel QSV, Nvidia, AMD APP), plus its top-level software decoding/encoding kernel to dramatically accelerate (4K/HD) video processing speed up to 16X faster than before and 5-8X faster than any other competitor, with perfect balance between quality and size. Conversion from one video to another is usually regarded as a time-consuming process and a CPU-intensive task. Thus, video converter delivering fast transcoding without slowing down computer performance is highly demanded. MacX Video Converter Pro V6.3.0 addresses the needs by leveraging the revolutionary hardware acceleration technology - Intel® Quick Sync Video, Nvidia (CUDA/NVENC) and AMD APP - to convert videos in lightning speed, up to 16X faster, compared with its previous edition. By the time you read this, you might wonder What hardware acceleration is and what Intel® Quick Sync Video is on earth and how they work to accelerate video conversion speed. No rush! The below parts will throw light on the Intel® Quick Sync Video hardware acceleration tech, as well as GPU hardware encoding (Nvidia/AMD) in details. Yet, prior to illustrating the info about Intel QSV, you're suggested to figure out what hardware acceleration is and the difference between CPU and GPU hardware acceleration tech first if you lack this kind of background knowledge. If you do have, jump to the part you need. Hardware acceleration, as its name implies, refers to the use of computer hardware to improve task execution efficiency and make jobs done at much faster speed than that in a software program running on a general-purpose CPU. Usually, when it comes to hardware acceleration, it means CPU and GPU hardware acceleration for video decoding and encoding. And the typical example of CPU hardware acceleration is Intel Quick Sync Video and the representatives of GPU acceleration include Nvidia CUDA, Nvidia NVENC, AMD APP and more. Basically speaking, the video decoding and re-encoding are highly related to the compression technology based on spatial similarity, and the basic container of processing is the matrix, which is just what GPU handles well. And the tasks GPU can accomplish during the video transcoding process include motion prediction, motion compensation, DCT transformation parts between frames and interframes in the matrix, etc. Yet, as for the extras like DCT quantization, variable length coding and something involved with sequential processing, GPU becomes powerless. In such case, it needs CPU to save the big picture. And when it comes to the difference between Intel CPU-based QSV and GPU-based AMD/Nvidia hardware acceleration tech, it's the same thing. CUDA is a Nvidia GPU hardware encoding technology that use the usual GPU hardware (rather than CPU processor) to encode video to H264. Thus, your general purpose processor CPU can be released to handle more tasks at the same time with better responsiveness. It's worth noting that this GPU hardware encoding only supports H264 codec. If you need to hardware encode video to HEVC, its successor NVENC is worth your consideration. Nvidia (NVENC), the successor to CUDA, focuses on the graphic processing and can utilize matrix computing accelerator, alongside with GPU multi-thread, to achieve more efficient memory operations and calculation to whopping quicken some codecs transcoding speed (e.g., H264/HEVC). What's more, NVENC acceleration only works for video encoding. It won't participate in anything ( hardware decoding incl.) that doesn't concern video encoding. And Intel Quick Sync Video is entitled to assign parts of multimedia processing tasks to GPU to make transcoding faster (away from Intel Meltdown and Spectre patches) while enabling the processor to do other tasks simultaneously. Of course, optimizations about multimedia operations are also done in CPU cores like extended instruction set MMX, SSE, which are regarded as the most important accelerators to speed up HD and 8K 4K video decoding and re-encoding at present. That partly explains why Intel QSV hardware acceleration makes more codecs transcoding faster, covering not only H264/HEVC, but also MPEG-4 AVC, VC-1, H.262/MPEG-2 Part 2, VP8 and more. In terms of video transcoding task, GPU, more specialized processor, has the built-in advantage. Yet, it can't finish these tasks unless it gets the task schedule and certain operational supports from CPU (general-purpose processor) during GPU decoding/encoding video (SD, HD, 4K UHD) procedure. Generally, they're partners. But if you have to choose one from them, then CPU hardware acceleration (Intel QSV) no doubt comes first. Intel® Quick Sync Video applies the dedicated media processing power of Intel® Graphics Technology to make video decoding and re-encoding process much faster than that just on a CPU. And it also steps up system responsiveness a lot by relieving processor burden to perform other tasks. The only downside is that Intel QSV tech isn't supported by any Intel CPU. Generally, if the Intel CPU processor of your computer is launched in 2011 or later and armed with Intel® HD graphics GPU or Intel® Iris™ graphics GPU, your computer supports Intel Quick Sync Video in most cases, no matter the Intel® Core™ i3 - i7 or Intel® Xeon® processor. Certainly, that's not the whole story. if you're not sure about this, you can visit ark.intel to have a check. As is known to all, you can't activate Intel® Quick Sync Video hardware acceleration for SD/HD/4K UHD video processing unless both your computer hardware and software program support Intel QSV tech. The hardware requirement is easy to satisfy. It's not the same case to the QSV supported software program. Fortunately, there is one - MacX Video Converter Pro, featuring Intel Quick Sync Video tech to help you decode and re-encode video (4K) at 16X faster speed. Yet, how does it work to boost the conversion speed? Three aspects. 1. Task priority. Compared with other instructions of Intel QSV unsupported programs, video conversion instructions are placed at the top of the instructions list. Meanwhile, the CPU would also give priority to Intel QSV video conversion task when it comes to the arrangement of RAM. That's to say, if it requires 500MB RAM to convert video files, CPU will firstly leave enough memory to meet conversion need. Other tasks come second. 2. Intel® graphics technology. Intel Quick Sync Video also makes great use of Intel® graphics GPU including Intel® HD graphics GPU and Intel® Iris™ graphics GPU by assigning parts of graphics processing tasks to GPU so as to reduce processor burden and let CPU carry out other instructions. 3. The MacXDVD developer team is constantly improving MacX Video Converter Pro's decoding and encoding engine to the maximum performance so as to guarantee the transcoding speed both on software and hardware up to the optimum condition. The theoretical explanation is nowhere near as convincing as the real test data. If you have no idea how fast the Intel QSV supported video converter for Mac will become, you can read on the following charts, which show the Intel-enabled MacX Video Converter Pro's performance gains compared with its previous edition and other converters in the market, respectively. Tests carried out by MacXDVD Software. Computer specifications: macOS Sierra (10.12); 4.0GHz quad-core Intel Core i7; 2TB Fusion Drive; Intel Iris Pro Graphics 6200. Hardware encoding performance is greatly dependant on your computer configuration. The higher configuration your computer is, the faster speed the program performs. By applying the innovative Intel QSV technology, MacX Video Converter Pro enables to compress and convert videos 16X faster with quality the same as in the original file. We have conducted a side by side conversion speed test between the Intel-support V6.3.0 and its previous edition. Below is the result. Video converters optimized for hardware acceleration to save a good deal of time for encoding is nothing new to Windows users. But if you are running on a Mac platform, hardly can you find such kind of program. Luckily for you, MacX Video Converter Pro happens to be the world's unique Mac video converter that leverages the advanced Intel Quick Sync Video, Nvidia (CUDA/NVENC) and AMD APP to accelerate (4K) H264/HEVC video conversion to revolutionary fast. Thanks to the technology, now the latest edition 6.3.0 skyrocketed to the world's No.1 fast video converter for Mac, surpassing other rivals as many as 5-8 times. Just check out the test result below. Thanks to the optimization for the Intel QSV CPU and GPU hardware encoding technology, coupled with the powerful conversion kernel, multi-core CPU and Hyper-threading technology built in MacX Video Converter Pro, video conversion processing enters a new era. Its intuitive interface makes operation of the video converter a cinch, more with might doubled. 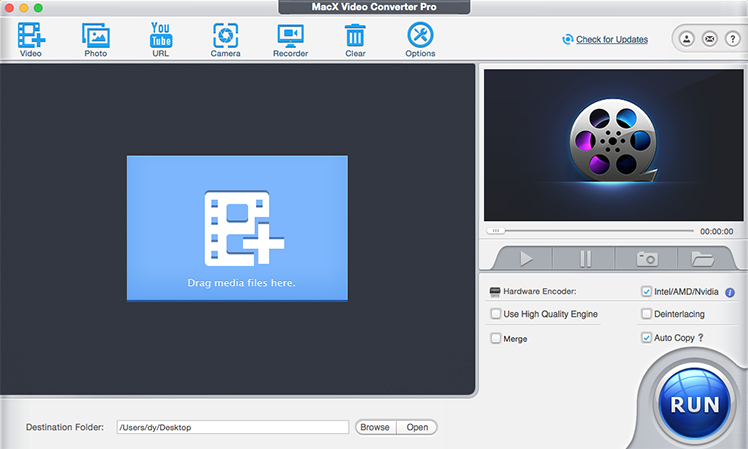 Here take a look at the step-by-step guide on how to convert videos on Mac in minutes. Choose the output format from the drop-down window. Check the QSV box at the lower right of the interface to enable hardware acceleration. Hit the "Browse" button to save the output video and click "RUN" to start converting. 1. 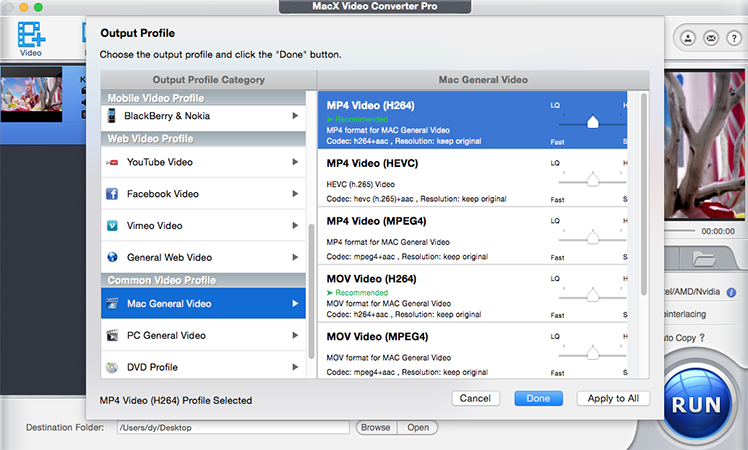 The Intel QSV/Nvidia/AMD option is selectable in the latest version of MacX Video Converter Pro V6.3.0 and it enables to convert video to H.264/HEVC encoded file formats only. 2. The Intel QSV is only available in the second generation Intel Core Processor or later, so make sure your Mac is equipped with a Sandy Bridge CPU 2nd Gen Intel Core i3, Core i5, Core i7 Processor or higher to conduct the hardware acceleration. 3. For a fast conversion, please be sure of having the newest driver. Q. What is hardware acceleration? In computing, hardware acceleration is the use of computer hardware to perform some functions faster than is possible in software running on a more general-purpose CPU. Q. What is Intel Quick Sync Video? Intel Quick Sync Video is the name given to Intel's hardware video encoding and decoding technology built right into 2nd generation Intel® Core™ processors. It uses the dedicated media processing capabilities of Intel® Graphics Technology to make media processing, and video creation and conversion fast and easy. Praised for its speed, Quick Sync allows decode and encode fast, while also enabling the processor to complete other tasks, providing excellent PC performance and responsiveness. Q. What're advantages of Intel QSV Technology? 1. According to Intel, the QSV technology provides some dramatic performance gains when doing video encoding tasks like converting video from one format to another. 2. Using the Quick Sync tech, the video conversion can be switched over to the graphics unit, thus freeing up the processor to be used for other tasks. Q. What can you benefit from Intel QSV-enabled MacX Video Converter? 1. Less CPU usage: The load on CPU is significantly decreased, up to 2 times. That's to say, you can do other tasks like websites browsing, online movies watching and more much smoother and faster than ever. 2. No loss of quality: The output video remains the highest possible quality, because hardware encoding outputs videos with quality that is hardly noticeable on iPads/iPhones/iPods, Android phones, and the like. 3. Unbeatable conversion speed: By courtesy of Intel QSV technology, MacX Video Converter Pro delivers up to an 16-fold increase in performance compared with the previous edition and proves to be 5 times faster than competitors regarding to video conversion. World's No.1 fast video converter for Mac. MacX Video Converter Pro make full use of Intel Quick Sync Video technology to convert videos on Mac as fast as possible. This option is selectable on Macs equipped with a Sandy Bridge CPU 2nd Gen Intel Core i3, Core i5, Core i7 Processor or higher. And make sure you've upgraded your Intel processor driver to the latest version. You can find the newest version at Intel's official website here >> . We recommend only downloading drivers and other software from trusted sources.